A Little Caviar And Harry Potter? Harry Potter's wizardry has happened so often it almost seems old hat: A book goes on sale in another country to much hype, drawing dedicated fans and selling like magic. The books have vanished fast in Russia as well. 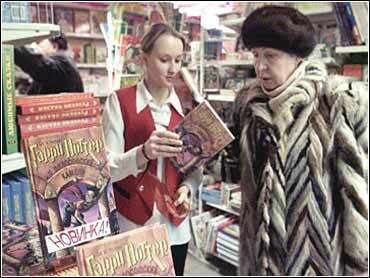 But it's still early to talk of "Pottermania"  former President Boris Yeltsin's memoir is disappearing twice as fast. An official translated edition of the first book in the series, Harry Potter and the Philosopher's Stone, finally hit bookstores Dec. 7. The release was none too soon for 11-year-old Harry's hard-core Russian fans. Thirsting for a Russian translation of the J.K. Rowling books that have topped Western best seller lists, they started a Russian Web site dedicated to the boy and his magic powers, and translated fragments themselves. "There's something about the books that makes people a little crazy," said Natalya Chuprova, research director for the Moscow-based Moskva bookstore chain. "It's quite popular, especially for a foreign book." Critics differ on why Russians like Harry, who fights evil with spells and flying brooms. Some say his popularity reflects a fascination with Western culture, though Russia's obsession with all things Western has waned considerably since the early 1990s. Others say Rowling's books echo Russia's rich tradition of fantasy literature, but with a lighter more wholesome theme. The books have been published and released in nearly 40 countries and in nearly as many languages. But the mania seen elsewhere has not been attained in Russia. Most Russians have never heard of Harry especially in hard-to-reach provinces. Even in Moscow advertising and media coverage of the book release were minimal. Many buyers had heard of Harry Potter through the Internet, which reaches just a fraction of Russian homes. Others encounter him for the first time in the bookstore. Larisa, who would not give her last name, was enticed by the colorful display in Moskva's flagship store across from Moscow's City Hall and decided to buy the book for her 8-year-old son. "I'm looking for something different," she said, waiting to turn over $1.70 for the book in a line of wool- and fur-bundled shoppers Wednesday. The price was slightly higher than average for the genre, but well below Western prices and the $11 for the English-language version available in Moscow. The Potter phenomenon has riled some pious readers in the United States, deriding it as promoting witchcraft. The Rosmen publishing house, which won the rights for the Russian translation, is hoping to avoid such controversy. "The ideas are universal. The boy is fighting evil, for the sake of good," said Anya Dudkina, Rosmen's marketing manager. Besides, she added, Russian culture is rich with superstitions tolerated by the Orthodox Church, the country's leading religion. Newspaper critics have called the book "fantasy light," comparing it to the darker, more grown-up taes that flourished in Russia for the past century, from the interplanetary adventures of the Strugatsky brothers to Mikhail Bulgakov's mystical Master and Margarita. More than 1,000 copies sold in Moskva's biggest store over its first 12 days of sales, Chuprova said. That's well above the 50 sales a month considered a decent run, but half the rate of Yeltsin's Presidential Marathon. Some critics complain that translator I.V. Oransky failed to capture the whimsy and double meaning of Rowling's names. Instead, he transliterated them directly, confronting Russian readers with a jumble of foreign-sounding letters. "The problem is the terrifying poverty of Oransky's language," Lev Danilkin wrote in the Vedomosti newspaper Tuesday. "Instead of a very good fairy tale it ended up an amusing, implausible story from the life of British teen-agers."